Never heard of Dunder? Well, we thought this was a good reason to offer a Dunder casino review – because they are a growing force in the online gambling sector. The site was only established in February 2016 by two Swedish gamblers who love the gambling experience. It may seem brand spanking new – but already the site has a loyal customer base. It also offers over 800 casino games – which means it is one of the biggest sites on the internet for choice – and this is not even its stand out feature – but more on that later. Before we hurtle headlong into a Dunder casino review, lets give you some more facts about the site. Dunder targets an international market, therefore it accepts an impressive range of payment options and currencies. However, much of the operation relies on the Euro and other currencies tend to incur fees. One of the best platforms to use when funding your Dunder account is a site called Trustly. Through this site Dunder can process withdrawals almost instantly – and it is free of charge – unlike most other payment options with the site that incur a 2.5% fee. The site is secure and is licensed with the Malta Gaming Authority and with the UK Gambling Commission. This means the casino is run under strict regulations. The site is intuitive and works well in instant play. There is a modern interface – as Dunder is certainly part of the new generation of online casinos that embraces the style of the gaming consoles. The website is intuitive and easy-to-navigate – but there may be a certain disappoint for gambling traditionalists who prefer the casino style feel to their online gambling. The site was clear it was going to be innovative – and focused on beautiful graphics and amazing sound quality. We like this and see it as a positive in our Dunder casino review. We certainly feel that a casino entering the market today needs to acknowledge the maturity of the gaming experience of the user. 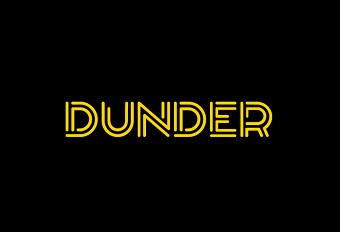 When Dunder was launched it promised high-quality casino games. They certainly delivered. The company sought a variety of games – almost 800 on offer – from the leading names in software development. It could be that such a variety of games means there are a lot of duds amongst the quality – and that finding those rich gems might be difficult. However, two points are worth making in this Dunder casino review: 1) there are not many duds amongst the rich crop of brilliant games and 2) Dunder have worked hard to ensure that the navigation around the site is as easy as can be. You will easily be able to find your favourite games – and you will have many favourites on this site. There are comprehensive game categories on the site with games grouped by theme, type and features. You can also search for the game by supplier. Dunder is available for instant play and there is little need for a downloaded version – so they do not offer it. They see that a stable internet connection is a given nowadays – and that forcing the download of software is a pain for users. It is up to you to decide if this is true or not. Many of the top casinos tend to offer both in-browser and downloaded gaming – and you will certainly need to make sure you have the latest version of flash – to ensure uninterrupted play. One of the biggest selling points in any Dunder casino review is the sheer volume of games available. The site takes the best of games from developers such as Net Entertainment, Microgaming, Betsoft and Evolution Gaming. Anyone in the know with gaming will understand that Evolution Gaming means live dealer action – and the site offers a lot of this too! Table games are the most popular on the Dunder site. A Dunder welcome bonus is that the different software developers offer different variations on the same games – some classically designed and some more modern innovations. An example is blackjack – where there is European and Classic versions – but then there is Vegas Single Deck, Vegas Downtown and a version called Double Exposure. The video poker on the site is a lot more relaxed than on other sites – which is an upside in this Dunder casino review. A downside? The roulette tables tend to come with a double zero and no jackpot – significantly reducing the player’s chance of a decent pay out. Player reviewers of the site rave most about the live dealer experience on the site. They tend to prefer the authentic casino experience in this section of the website – over the more gamer orientated games in other areas of the site. The live streaming allows real-time gaming experience – which does up the level of excitement a good deal. The Dunder welcome bonus really is a great welcome to the site. There is up to 600 euros of reward and 200 free spins – which is probably one of the more impressive we have found. The Dunder welcome bonus comes with some Ts and Cs – but then so do most. You will get the maximum Dunder welcome bonus if you make up to three deposits at the maximum reward level offered. The 25x play through rate is reasonable – but the inequality in wagers is not so reasonable. Only 10% of the wagering requirement can come from table games, none of it from poker – meaning the majority will have to be spent on the slots – a place where the return-to-player percentage is at its lowest. For a new kid on the block, this is an impressively positive Dunder casino review. There is a lot to be said for the sheer wealth of choice, matched with clever website navigation and attention to detail in live gaming.